Susana married her high school sweetheart who joined the Coast Guard. A baby came and they moved around. She always wanted to go to college, but it was hard to make the commitment. Working as a Starbucks barista, Susana heard about the College Achievement Plan and signed up the day it was announced. “It’s my ticket to go back to school,” she said. Part of a growing trend, Susana works for a company that provides education as an employee benefit. It’s primarily a talent development strategy. In some cases, it’s retention strategy. More broadly, it’s a corporate social responsibility strategy. Following is a quick look at this emerging landscape. 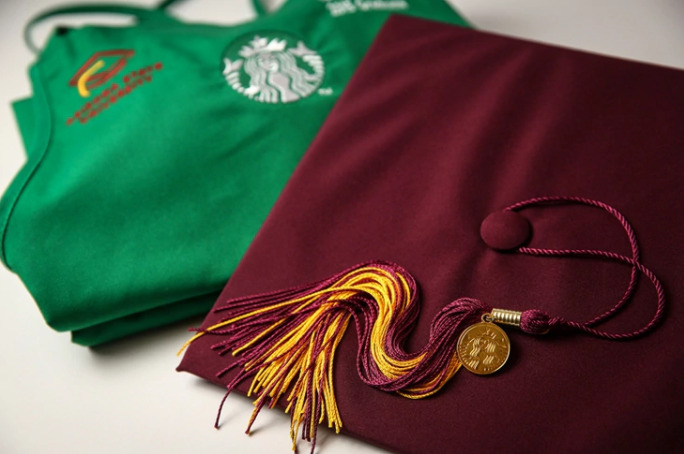 Full and part-time U.S. partners (employees) at Starbucksenrolling in ASU Online are eligible for full tuition coverage toward a bachelor’s degree. Partners receive support from coaches and advisors, 24/7 tutoring on a variety of subjects, and a choice of more than 60 undergraduate degrees. The Starbucks reimbursement covers tuition cost beyond any aid provided by ASU or the federal government. A year ago Arizona State University added a Pathway to Admission program which offers access to up to 10 freshman-level courses tuition-free. ASU Online (@asuonline) serves 33,000 students and extends access to the nation’s most innovative university. As ASU proclaims, the partnership with Starbucks raises the bar for the role a public company can play in support of its employees’ life goals. Though Amazon Career Choice the online giant pays up to 95% of tuition and fees (up to a yearly maximum) towards a certificate or diploma in qualified fields of study, leading to in-demand jobs. Some classes are held at Amazon facilities. More than 10,000 employees have participated. The American Hotel and Lodging Association, the American Hotel and Lodging Educational Foundation and Pearson have recently partnered to launch a new pilot program to offer women and men in the hospitality industry a cost-free degree. Thanks to this critical investment, AHLA member companies that invest in tuition-assistance programs, employees from 10 hotel brands, and management companies representing 1,500 hotel properties will have the opportunity to advance career and economic prospects through higher education – free from the barriers that traditionally stand in the way, such as costs, time commitments and complexity. It is a win-win scenario in its truest form. Nearly half of the industry’s general managers started their careers in entry-level positions, while many C-Suite executives began their professional journeys as dishwashers, bellmen or front desk agents. Through the Learning Together Program, Boeing reimburses college tuition, books and fees for degree and professional certificate programs and individual courses at high-quality schools.